take some personal time to kick back and do nothing. LOL! Create Pen and Touch pad I received for Christmas .............. I can see this will take some time to learn. Anyone with a tip, trick, tutorial or link to help further my slow moving pursuit, I would be very grateful. Thanks so much. Good luck learning the Wacom, I gave up about 3 years ago. Thanks for your generosity Jerry. A happy, healthy new year to you and yours too. Thanks so much for your generosity in sharing your wonderful creations. They have enhanced my photography so much. I just viewed your slide show - excellent images. Wishing you a wonderful 2012. Wow...thanks so much. You're awesome. I can't wait to using them. Many thanks and a joyful, peaceful and healthy 2012 to you. I'm still persevering with my Wacom too, they do take some getting used to. These are just lovely, and I really like the postcard ones especially. Thank-you so much and wishing you a happy and enjoyable year ahead. thanks so much for these, happy new year to you and yours, and good luck with the wacom, I tried one and didn't get on very well. Thanks for the lovely textures! Have fun with your new toy. Beautiful textures. Thanks so much for your generosity! Hope you have a blessed and prosperous 2012! Good luck with the tablet! Thank you so much for this post. I want to let you know that I posted a link to your blog in CBH Digital Scrapbooking Freebies, under the Page 4 post on Jan. 13, 2012. Thanks again. Thank you so much for sharing. These textures are almost works of art on their own. I wish you all the best in 2012 as well. Espero que hayas tenido felices fiestas y hayas descansado. Beautiful work, thanks so much for being so generous with it! Hi Jerry, I use your textures ALL the time...they're wonderful. Thanks for your generosity in sharing...I'm off to make a donation! Happy New Year Jerry , good luck with the new toy , im curious to see how you get on! Thank you, Jerry ... you are amazing. ... Happy New Year! Thank you so much, Jerry. Wishing you and yours a Wonderful 2012--and may happy hours with your Wacom! Thanks so much for the textures - they're beautiful as always. I also just got a Wacom Create tablet - there is definitely a learning curve! I will be doing a write up on your blog and your awesome textures and more . It is rare to feel connected with another artist , as I feel connected with you . Your work is AMAZING ! It is also rare to find someone who shares such talent . Thank you so much . I will be using alot of your work and will send anyone I can your way . Thanks for being such a talented artist ! Jessica Sprague has some Wacom classes. I have not taken those, but the classes I've taken were great. Also, do you know about Pen Scrappers? That is a site supported by Wacom that has some tutorials. It is a very cool tool - I am certain that you will make great use of it. I love your creations, you're so talented. Thanks a bunch! Don't give up on the Wacom. I use it daily and it has not only saved my wrist, but I can't imagine ever using the cumbersome mouse again. Thanks for sharing your knowledge and your textures! Thank you, Jerry. I know I'll be able to put these to good use. I have used my Wacom twice since I got it last summer, so I don't have any tips, but I hope you have fun with it. Keep us updated on your experiences with it. Happy New Year, Jerry! Thank you for these beautiful new textures. I have no doubt that you'll soon be producing many amazing images with the use of your new toy. The biggest tip I have for the Wacom- forget it's a tablet. Really. As soon as I stopped panicking about the new equipment & everything I had to learn to use it- it got a LOT easier. Use it as often as you can- not just for art. Soon enough, it begins to feel more like an extension than just another tool. I love mine & I finally relaxed enough (2 months in!) to let it teach me how to use it. My art is better for it... so don't' give up! These are great. Thanks. I use them as backgrounds for my ancestor scrapbook. Your work amazes me. Thanks very much for sharing your great work. Thanks so much for all of these wonderful textures! Thank you! I have a Wacom tablet, but mostly just use it as a mouse and mousepad! Hope you had a great holiday! Ah, another awesome set of your textures and masks. You are amazing! I sure thank you! Thank you, Jerry! I continue to be inspired by the generosity of texture artists like you. Have a fantastic 2012! Thank you again Jerry, for the much fun I have had for the last 2 years, since I found you in Flickr for the first time. Your textures opened a new amazing world of possibilities to a new amateur photographer like me. I have found your blog today, and I'm already a follower. 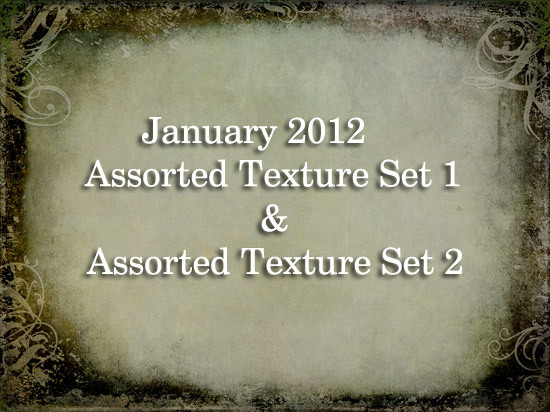 Thank you so much for making these great textures and the other goodies available to us! When you generously share your beautiful textures you enhance the artwork of others around the world. Thank you for spreading the love my friend. You are valued and admired. Your textures are amazing and so are you! All the best for this new year in creativity, life, love and happiness! Forgot to add, I have a Wacom Intuos4 tablet with pen. Not a touch screen but they work a lot alike. I found any help I need I can get through Wacoms own website or through NAPP and Adobe ... they have great links too. It takes some getting used to but once you start using the pen more than your mouse ... you know you're on a roll. Thank you so much you are incredibly talented!